Dundee Stars coach Omar Pacha bemoaned big decisions going against his team in a crucial weekend for their play-off hopes. Two losses leaves Stars three points off the top eight, but Pacha was defiant that his team can still break into the crucial spots. The normal weekend of fixtures was somewhat decimated due to the Challenge Cup final, but it was a couple of days that could have ramifications down the line. Glasgow Clan became the third team, after Belfast Giants and Cardiff Devils, to book their place in the play-offs after missing out last year. Meanwhile, Fife Flyers pulled themselves a little closer to the line as they and Sheffield Steelers shared the points over their two contests. Dundee Stars are facing a tall order in the final weeks of the season if they are to get themselves into the post-season party. With seven games left they have only two at home, not to mention tricky contests against title-chasing Belfast Giants and Cardiff Devils among them. It's a precarious outlook for Pacha and his team, who was left seething by decisions that went against his. "Another night, another controversial decision that didn't go our way," he said. "We thought the puck had gone in and when we checked the replay, to me, it had. But it wasn't given, play continued and they scored. "It's the first time in my career I've seen that and it set us back. It seems that big decisions or game-changing moments seem to go the other way. "We've had a goal chopped off here. We had one taken off us in Nottingham and our goalie was clattered last week. We have to stay strong mentally and keep our composure. "The play-off push is still on for us. We have to keep pushing and with seven games to go, we're three points off so there's no reason to feel we're done yet. I still believe." Stars wanted to keep the pressure on Manchester Storm and Coventry Blaze as they began at Nottingham Panthers on Saturday. A 4-1 loss later and already the task got a little tougher as Panthers were four up without reply in the first two periods. Kevin Henderson, Alex Bolduc, Dylan Richard and Chris Stewart gave Nottingham an unassailable lead and although Brian Hart struck late on, it was a mere consolation. 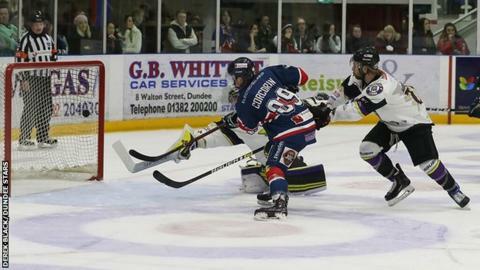 Dundee returned home to meet Storm on Sunday in a play-off four-pointer, but it was another miserable night for Pacha's side as the visitors opened up a three-point gap in a 4-2 success. Harrison Ruopp's opener was cancelled out by Charles Corcoran, but Storm were soon ahead through Ciaran Long after Matt Marquardt's effort was ruled to have not gone in. Luke Moffatt and Evan Richardson added further markers for the visitors to add to Dundee's misery as they moved into a 4-1 lead. Stars' Shawn Boutin closed the gap to two with a third-period goal. The night was made worse by news that Coventry Blaze won their game 5-2 over Milton Keynes Lightning. Fife Flyers and Sheffield Steelers traded points with victories in their respective home games over the weekend. Flyers were in Yorkshire on Saturday after Thursday's 4-2 loss to Cardiff Devils, but returned on the back of a 4-1 defeat, with Carlo Finucci the only Fife goal to celebrate. Back home on Sunday, it needed overtime as Fife got the only success for the Scottish teams this week in a 5-4 win. Two from Brett Bulmer and one each from Danick Gauthier and Evan Bloodoff got them into the extra period, with Rick Pinkston netting the winner in a dramatic climax. Meanwhile, Glasgow Clan lost their second straight game on Friday night as Belfast Giants limbered up for the Challenge Cup final with a 5-4 result. Scott Pitt, Guillaume Doucet and two from Gerard Hanson got Pete Russell's men close, but it was not to be as Giants kept up their title challenge before beating Guildford Flames 2-1 in overtime to retain the Challenge Cup trophy. With Dundee Stars facing five of their remaining seven games on the road, their record on their travels recently has yielded seven straight losses. Glasgow Clan have now lost nine of their past 10 games at Belfast Giants after their defeat there on Friday. "We lose a goal with a minute and 52 [seconds] left, it's probably to pack up and start looking to next weekend. We didn't do that." - Fife Flyers coach Todd Dutiaume talks up his team's battling qualities after their dramatic overtime win over Sheffield.